State Street's tattoo shops mainly catered to sailors in the Great Lakes area. .
Dale Grande, left, working at Chicago Tattoo. Chicago Tattoo and Piercing Co. is located at 1017 W. Belmont Ave.
Editor’s note: The podcast episode available above includes two stories. The first story explains Chicago’s fascinating role in pinball industry and imagery. The story about Chicago’s history of tattooing begins at 8 minutes, 45 seconds. Enjoy! It’s hard to avoid Chicago’s tattoo culture. Getting ink — from simple line-drawings to Asian dragons — has practically become a rite of passage, and tattoo parlors have become staples of the area’s street corners, not unlike barber shops and nail salons. Which is why it’s so hard to believe that for a single, nearly ten-year stretch, there was only one legal tattoo shop in Chicago. That’s right. Just one. Strange as this may now seem, from the mid-1960&apos;s through the early 1970&apos;s Chicago had one — just one — legal tattoo parlor. How did this happen to be the case? To get answers we tracked down people intimately familiar with Chicago’s tattoo history. From them, we learned how a lone tattoo shop withstood age-restriction laws, angry sailors, and a mass exodus of tattoo talent ... only to emerge as a single (albeit important) shop in a large field of competitors. Our principal sources — Chicago-based tattoo artists Dale Grande and Nick Colella — are familiar with the operation alluded to in Dan Zajac’s question: Chicago Tattoo and Piercing Co., which these days is located at 1017 W. Belmont Ave. Its former status as the only game in town is broadcast loudly and clearly by neon signs out front. Dale Grande lived the history involved in our question, as he’s owned or co-owned Chicago Tattoo since 1973. Nick Colella worked at Grande’s shop for about 20 years before opening his own, Great Lakes Tattoo, in 2013. The walls at Colella’s shop are festooned with Chicago tattoo memorabilia in hall-of-fame fashion, arranged in glass cases like vintage shrines. It’s safe to say he’s Chicago’s unofficial tattoo historian, and much of it involves Chicago Tattoo. Both Grande and Colella helped with our video, but the interview segments below provide even more insight. Nick Colella: There are two histories to Chicago tattooing. The first part is from the late 1800s until tattooing went underground in Chicago in the 1950s and 60s. How the Chicago tattoo scene looked in the 1930s. Nick Colella: South State Street had been this honky tonk area. It was all burlesque strip joints and diners and arcades. And in the arcades were the tattoo shops. All this was supposedly run by the mob, so every square inch was used for stuff. If there was a hallway underneath the stairwell, you could put a tattooer there. The Naval Station Great Lakes lies 40 miles north of Chicago. Young sailors would make their way downtown. Dale Grande: So, they would come to the city to party, get tattooed and go back to the base. And they are all 18 to 20-something years old. And it was a sailor’s tradition to get tattooed. Nick Colella: The sailors would get tattooed on their arms. On State Street you&apos;d actually pick [a tattoo] off the wall then go tell the arcade manager what you wanted to pay for it — a couple bucks — then get a ticket and get [your tattoo] done. There were so many sailors and people down there, so there were hundreds of tattooers in and out over the years. In 1963 the state of Illinois raised the legal age to get a tattoo from 18 to 21. Dale Grande: New York City had a spout of hepatitis that they claim came from some tattoo shops. Chicago [sic] saw this and decided to raise the legal age law [to get a tattoo] from 18 years old to 21 years old. Nick Colella: I always heard it was about cleaning up State Street. The state realized, you know, this is downtown. There’s money here to be made in real estate. They didn’t want strip clubs or tattoo shops there. The legal changes forced customers to seek tattoos elsewhere. Nick Colella: That 18 to 21 change didn&apos;t allow those tattooers to tattoo any sailors anymore, so that business was gone. They all left Chicago and went west, east or south. 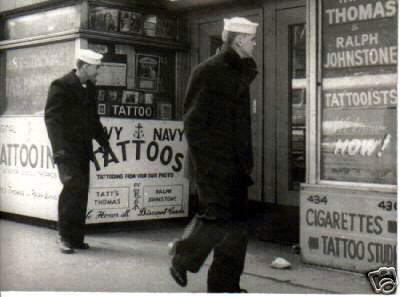 Chicago became a ghost town for tattooing because you couldn&apos;t make any money off these sailors anymore. Dale Grande: Eventually, Cliff — Cliff Raven — who had Cliff Raven Studio, was the only one in the city. Nick Colella: Cliff Raven was a guy who got into tattooing in the late 50s and early 60s by a guy named Phil Sparrow, who had a major standalone shop on State Street. When tattooing went underground in Chicago, Phil briefly had a shop on Larrabee Street then went to Milwaukee [Wisconsin]. Dale Grande: When everybody left, Cliff stayed because he was a Chicago man. He was a great person, talked to everyone, knew a little bit about everything. He had a B.A. from Indiana University. He was one of the great artists — I mean real artists — who got into the art of tattooing at that time. Nick Colella: I think Cliff stayed because he learned here and knew people involved in not just the tattoo scene. He was involved in leather and stuff. It was his home and he knew what he wanted. Nick Colella: That’s why he set up shop where he did [W. Belmont Ave]. Boystown, you know? Cliff Raven’s art changed Dale Grande’s life. Dale Grande: The first time you stepped into the shop you could see the art on the walls was so much better [than other tattoo art at the time]. I think I was about 20 years old at the time and I said, “I gotta get a tattoo here.” So I did. He goes, “Sure, why not.” I don’t think he thought I was serious, but I started coming in after work nearly every day. That was Spring of 1973. By fall of the same year, Cliff and his business partner at the time, Buddy McFall, had offered Dale Grande partial ownership. The shop’s name changed from Cliff Raven Studio to Chicago Tattoo Co., Inc.
Dale Grande: I vividly remember the day were talking about it. I said, “What about Chicago Tattoo? That says it all.” And that’s the name. At that time the tattoo industry was very closed-mouth, but we would come to work and there’d be a line already waiting for us to open the door. Something you’d expect being the only shop in the city. It was crazy. We’d get all these artists stopping in from all over the country just to see Cliff and talk to him. I would just sit there in awe and watch and listen and meet all these artists. It was really uncanny. It was great. 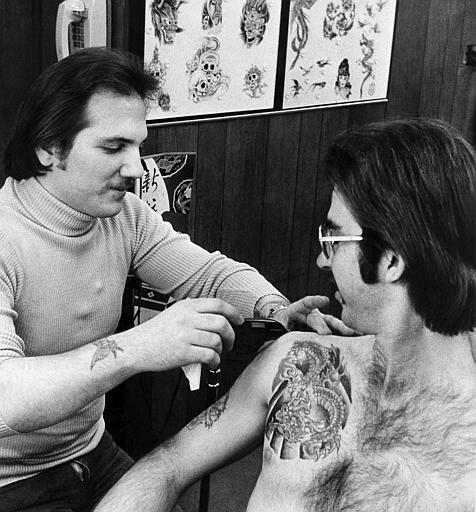 By the late 1970s, Chicago Tattoo had attracted many new artists. Some opened their own tattoo shops in Chicago. Dale Grande: When these shops started opening, first thing I would do was hop in the car and drive down there to see what was going on. And hopefully I didn’t see anything; it was just a rumor. It was always a bad feeling when someone opened up then. There was lots of good, stiff competition. You just gotta stay better. And we did; we stayed better … I wish those days were back again because now you’ve got something like 200 shops in and around the city. Cliff Raven, who operated during the industry’s lowpoint in Chicago, left an indelible mark on the local industry. Nick Colella: The tattooing landscape would not be anything without Cliff and Dale and Chicago Tattoo. People who are tattooing now don’t know where it all started from. They don’t know that there was a core group of people who are monumental in this city’s tattooing history. A lot of tattooers now take it for granted that these guys were the only tattooers in town. They think “Oh! They got all the business, that’s great!” … but they also got all the flak in town; all the b.s. They were those few guys going to work every day tattooing when it wasn’t cool, when it wasn’t on TV. They just did it because they had a drive to tattoo. And that’s why I keep this history alive - because no one else does. You go to Chicago History Museum and look up early photos of State Street and they only have three images, but I have the originals of them. Chicago wants to put that area of history under the rug so bad. The city’s always changing, but you have this history here that’s important … to some people. 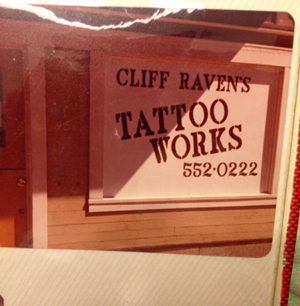 Cliff Raven left Chicago to open a new tattoo shop in California in 1977. Raven invited Dale Grande to join him. Dale Grande: It didn&apos;t feel right. I’ve been here for all of my adult life. And I’m still here. And we’re still operating. We’re still Chicago Tattoo. I just try to let others know that we’re still around. Dan Zajac is a lawyer who lives in Highland, Ind. He had known about Cliff Raven and Chicago Tattoo for a while, he says, but couldn’t put his finger on why the shop was ever the only one in Chicago. He had even done his own research on the topic. While we invited Dan to come along with us to investigate his question, he was only reachable by email. But he did let us know there’s a reason why he’s on the hunt for answers. 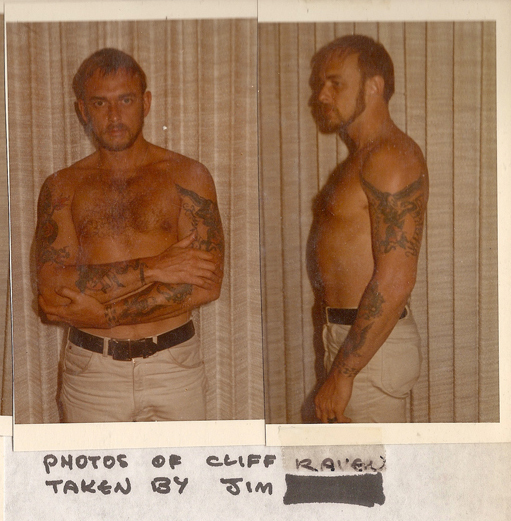 A personal reason: Chicago’s legendary tattoo artist was his uncle, Cliff Raven. Logan Jaffe is Curious City’s multimedia producer. Follow her @loganjaffe.